Greatest Events in Sporting History: Melbourne Storm Cheat The Cap: Was It Worth It For The Fans? Melbourne Storm Cheat The Cap: Was It Worth It For The Fans? In rugby league, in both hemispheres there is a salary cap for teams. This is to aid in two things, the first is to make sure the richest teams don't just sign all the talent and win everything every year (see Wigan in the late 80s and 90s) and to stop the clubs overspending and going to the wall, or almost going to the wall. It has now come to light in the past week that they were cheating by breaking the salary cap for these glory years by keeping a second set of books to keep their top players together, after all they do have some of the top players in the world playing for them. This was taking breaking the cap to the next level, this wasn't just by a few pounds like St Helens a few years back, this was by thousands of pounds a year. Their punishment is that they have had all their Aussie titles stripped off them (although no word about the world club challenge as yet) and ordered to pay back all prize money, as well as fined and not been allowed to gain any points this season. The thing is they still did win those trophies and, although they can wipe them from record books what they cannot do is take away the feeling the fans had on the day they won them titles. That is a great feeling. So the question is what feeling is the most powerful one? Winning the championship or the shame, as well as all the taunts from opposition fans, of knowing they won them by cheating? Well 26,000 fans turned up to the game last weekend, which I think tells us what we need to know, they are still backing their team, thanking them for the memories of those wins. On a side note, if Leeds Rhinos are given the prize money from the WCC game, here is what I think they should do with it, give it to charity, something to do with rugby league would be the best thing. Why? Well because even though they cheated, we still didn't win. 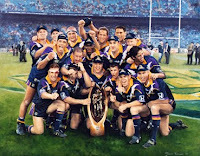 The records are been left blank for winners in the NRL, the same thing would happen with the WCC, the Leeds players didn't earn that prize money, they would be given it by default. Also what better way to improve the image of the club than to donate it all to charity?